This late Cretaceous herbivore is easily one of the most famous Dinosaurs of all time. Recognised for its truly spectacular appearance that’s almost like a cross between a Dragon and Griffin. Triceratops was also one of the last Dinosaurs to die out. It lived alongside the famous Tyrannosaurus Rex that fossil evidence shows would have preyed upon it. The image of the cruel king of the Dinosaurs facing down this magnificent beast is one that has long fascinated people for decades. Triceratops was roughly about 29 feet long, close to ten feet tall, and could weigh in at over 12 tons. Its skull was among the largest of any land animal, with the largest skull on record being 8 feet long almost a third of the animals whole body. It lived from 68-65 million years ago. It was the largest of a group of plant eating Dinosaurs called the Ceratopsians all of which had similar big frills around their heads. Many of them also had horns too with Triceratops meaning “three horned face”. There has been much debate about how the animal used its spectacular frill. Many experts have argued that it used it in defence against Tyrannosaurus Rex, whilst others have said that it was used to attract a mate or even just to help the animal cool down in the heat. 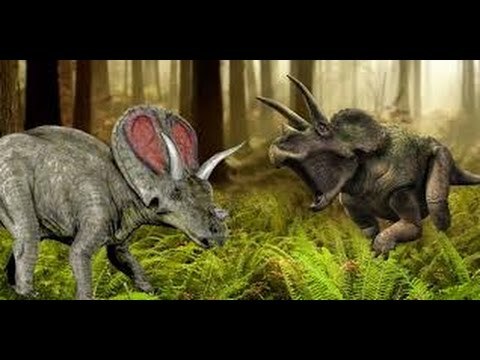 There is evidence for Triceratops using its horns to protect itself from a Tyrannosaurus Rex showing that even if they weren’t solely for that purpose then they were still an adequate form of defence. One Triceratops specimen has several bite marks made by a Tyrannosaurus Rex on its frill and horns which have all healed showing that the Triceratops was attacked whilst it was alive and that it somehow overcame its attacker. As to how Triceratops would have beaten off the Tyrannosaurus well there are many ways it could have done this. It could have been on its own when the Rex attacked but the rest of its herd may have then come to its aid. There has been some evidence for Triceratops’s living in herds. Or perhaps it managed to get a lucky shot in and gore the Tyrannosaurus to death. Triceratops could not charge head first like a Rhino as it is often depicted doing in popular culture. The front of its skull was incredibly weak and if it charged head first like a Rhino then its beak would have shattered. This was seen in the documentary The Truth About Killer Dinosaurs in 2005 when a reconstructed Triceratops head’s beak smashed to bits when being made to charge at an object at full force. The animal could run at 12 miles per hour. Thus Triceratops would have swung its head from side to side more like a wild boar when fighting than charging head first at the Tyrannosaurus. This would have meant that it would have had to have gotten near to the T-Rex in order use its horns which would still have been dangerous as even in a head on collision Tyrannosaurus would have a good chance of killing the Triceratops. The Triceratops that survived its attack with the T-Rex still had one if its horns broken in half by the Tyrannosaurus. T-Rex’s were known to regularly prey on Triceratops’s as there have been many bite marks from T-Rex’s found on Triceratops bones. Despite being heavily defended they would have been easy meat for the Rex’s simply because they would have been easy to ambush. That massive frill on their head blocked off all vision from behind and this coupled with their poor hearing and low intelligence (even by Dinosaur standards) would have allowed a Tyrannosaurus that could already run over twice as fast as Triceratops (T-Rex’s top speed was 25 miles per hour) to sneak up on it and quickly strike. All it would have needed would have been one good bite and the Triceratops would have been down. Still as seen with this specimen that lived to tell the tale Triceratops was still capable of holding its own against the Tyrant Lizard King and may have even provided it saw it coming have perhaps been able to turn the tables on it now and again. Whilst Triceratops’s are generally thought to have been herbivores there are some paleontologists who believe they may have been omnivores. This is based on the fact that their beaks were razor sharp and would have been capable of crushing bone just as easily as plants. Triceratops had a very powerful bite force greater than many famous carnivorous Dinosaurs. Thus it may have supplemented its diet with the odd mammal or small Dinosaur. It would have been like a Dinosaur version of an Enteledont a big ugly stupid, violent creature just wandering around eating whatever it wanted to basically. Other than Tyrannosaurus, Triceratops had no real predators with its thick hide and massive size rendering it immune to attacks from most Dromeosaurs though infants may have fallen prey to smaller Raptors provided they could be isolated from the rest of the herd. There has been some debate recently that the large Ceratopsian Dinosaur Torosaurus was in fact merely a mature form of Triceratops. If so this would make Torosaurus no longer valid as a species of Dinosaur much like Brontosaurus and Apatosaurus. This would also led credence to the idea that Triceratops did not use its frill to defend itself against Tyrannosaurus Rex as Torosaurus had massive holes in its frill which would have made it a poor form of defence. However this has been disputed by many paelontologists who cite key morphological differences between the two species and argue that the similarities between the two beasts are common among many different Cetaropsians. Until more specimens are found of both animals that would verify it one way or the other it can only be assumed at present that they are two different Dinosaur species.